Power saving mode is helpful to extend battery life on galaxy S9 and galaxy S9 plus devices. In galaxy S9 plus and galaxy S9 power saving mode, you can choose power saving mode from off/MID/MAX options. If use your galaxy device whole day, use medium power saving mode in galaxy S9 & S9 plus. If not use your device more, set galaxy S9 Max power saving mode. Let see how to use Power saving mode on Galaxy S9 and Galaxy S9 plus Oreo devices. You can change power saving mode setting under device maintenance settings. If you don’t want to use, turn off power saving mode on galaxy S9 and galaxy S9 plus. In Samsung galaxy S9 device maintenance settings, you can see your device’s maintenance status also. Follow below given step by step process to enable and use power saving mode on galaxy S9 and galaxy S9 plus. Here you can see Battery, performance mode, storage and memory option at below screen. Now see battery usage, power saving mode, app power monitor, unmonitored apps and always sleeping apps options. It will helpful to use your galaxy S9 and S9 plus whole day. When turn on medium power saving mode on galaxy S9 & S9 plus, disable always on display and lower brightness. Also settings for disable apps running in the background for not receive updates if available. You can enable/disable background network usage, AOD, speed limiter and set decrease brightness in your S9 & S9 plus. When turn on Maximum power saving mode on galaxy S9 & S9 plus, some function not working properly but you can still send messages, use certain apps and make phone calls. You can also use save power to galaxy S9 & S9 plus, it will stop apps from using your battery, while you are not using them. And that’s all. 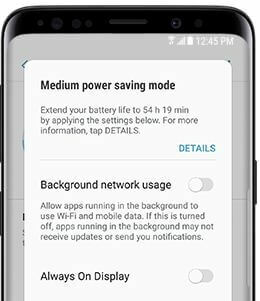 Did you find above article helpful to use power saving mode on galaxy S9 and galaxy S9 plus? If you have any question, tell us in below comment section. Don’t forget to share with others, if you found it helpful.